The PA4500 series plasmas are a line of budget priced, 720p HDTVs. They are short on bells & whistles to cut costs but if you are looking for solid picture quality at a low price, then the 42PA4500 is worth a look. 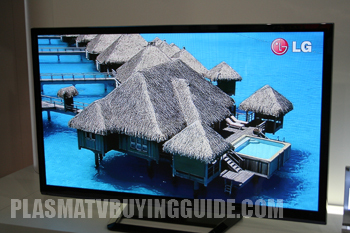 LG has improved the picture on their plasma HDTVs in 2012 and the 42PA4500 is no exception. The 720p panel has a new black filter that improves contrast and black levels which also improves the color performance of this TV. Don't let the fact that this plasma TV is 720p scare you off, most cable and satellite broadcasts are still 720p or 1080i as are most video games. With Blu-Rays the TV will have to downscale the content but for the most part you will be watching programming at the 42PA4500's native resolution. This is an area where plasma still dominate LCD and LED screens. On the 42PA4500 the picture remains vivid from the center of the screen until you move far enough left or right that you can no longer make out what is on the screen. This is an area people discount at first but with these large televisions there are often guests watching movies or sports and if they are not directly in front of the screen their experience may suffer. The 42PA4500 has a glossy, black plastic bezel surrounding the panel that is a fairly standard look in modern HDTVs, it will neither turn you away or blow you away, however, we were not fans of the new U shaped stand that the TV sits on. A 2.5" in depth it is rather slim for a budget priced plasma television.